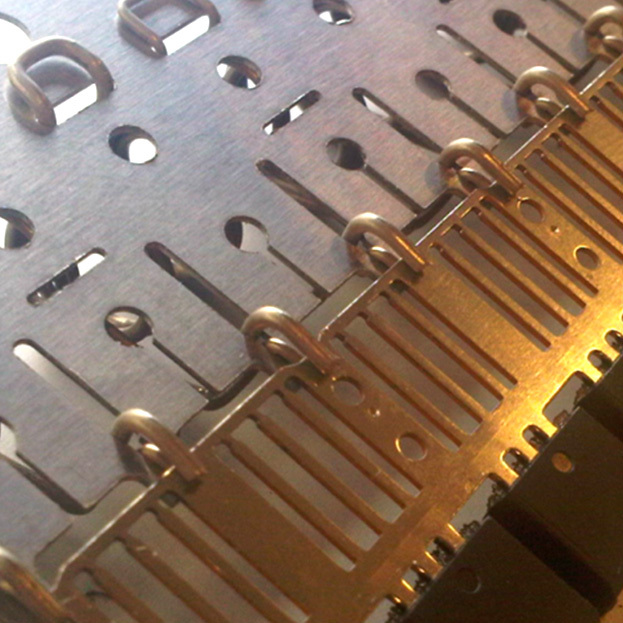 With an installed base of over 350 EDF/EPL systems, Meco has set the industry standard for leadframe solder plating. The system is fully customized to your specific needs and is a green solution, with low power consumption and minimal chemical usage. The Meco Electro DeFlash and Electro Plating Line are designed for the future and are capable of handling any kind of leadframe product. Any leadframe size up to 110 x 315 mm can easily be handled on the Meco EDF/EPL. Meco has become the industry standard for leadframe solder plating with an installed base of over 250 of these computer controlled EDF/EPL systems, and still growing strong. In the past, leadframes were plated by hot dip or rack plating, either in hand or in hoist operated plating installations. Apart from being a labor-intensive operation, the biggest problem is the uneven thickness distribution of the solder finish. Much of the success of subsequent soldering depends upon the purity and the right amount of thickness of the tin-alloy. Too little thickness: the deposit will not pass accelerated aging tests. Excessive thickness on fine leds for SMT may cause bridging during actual soldering. Uneven thickness distribution is caused by: A) rack design and uneven anode position; B) variable strip length and width of leadframe creating gaps between two strip ends resulting in "dog-boning" effect. The ideal solution for solder plating cut strips of leadframes would be a simulation of a fully continuous reel to reel plating system. The Meco EDF/EPL System Provides Such a Solution! The molded cut strips are placed in stack or slotted magazines and fully automatically loaded onto an endless carrier belt. A specially design clip device holds the strips in mechanically and electrical contact with the metal carrier belt as shown. The continuously moving carrier belt, upto 8m/min, transports the strips through pre-treatment, rinse, plating, post treatment and drying stations to the fully automatic, synchronized unload position where the strips are discharged into the magazines. In the return passage the carrier belt can be stripped to remove possible flash deposits. The continuous processing of the strips by the carrier belt through the machine has two major benefits. One, it offers excellent distribution, because as any individual strip goes through the plating cell, it sees the same set of plating conditions as the previous and the following strip see. Therefore, distribution from product to product is excellent with little or no variation seen in distribution from one product type to another type. In addition, the products are very close to each other loaded onto the carrier belt. The gap is only 2 or 3 mm between each product, therefore no burning is seen, similar to normal reel-to-reel processing. In addition, bottom shielding in the plating bath is controlled by the computer and is menu-driven based on the product. The shielding reduces the plating on the lower areas of the product (dog bone effect) and is fully automatic, requiring no operator adjustment. 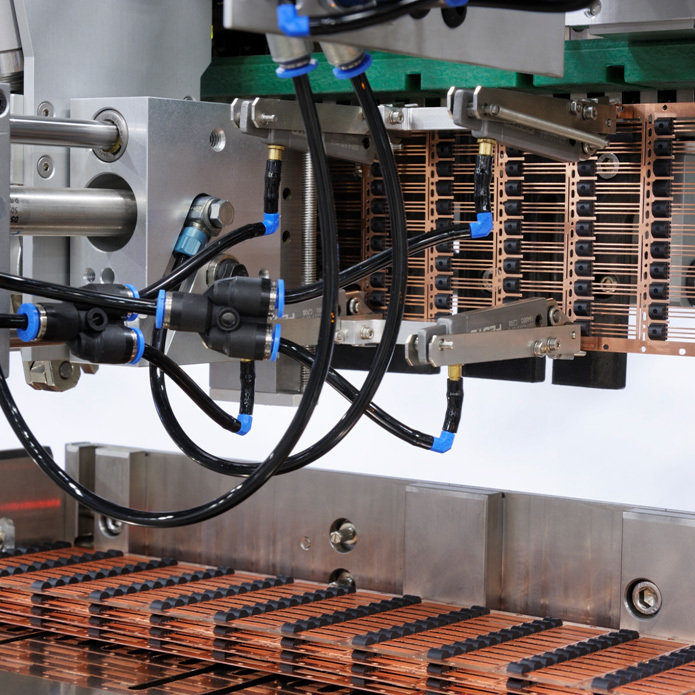 The carrier belt in combination with the universal loading and unloading systems makes this plating line very flexible for running a large variety of product types like powerframes, discetes, QFN and matrix-frames. The machine can handle all frame sizes with a minimum length of 150 mm to a maximum of 269 mm and a minimum width of 20 mm to a maximum width of 90 mm. With just a few product related parts, fast change-over times (up to 5 min) can be achieved by just one operator. 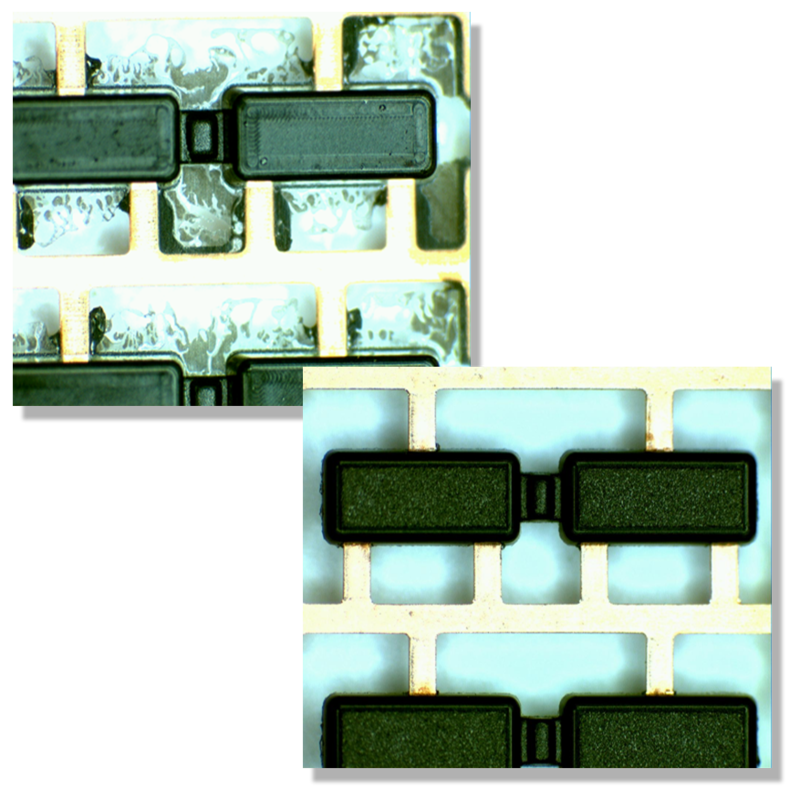 After molding, some of the mold residue (resinbleed) might get stuck on the leadframe. Especially on the functional areas, such as heat-sinks and between leads, no flash is allowed otherwise they do not get solder plated. To remove this thin flash before solder plating we can offer our Meco EDF system which can operate standalone or can be integrated into the Meco EPL solder plating system. After the frames are loaded onto the carrier belt, they are soaked in a 'deflash'-solution in combination with cathodic current. These chemicals are slightly softening the mold-flash/bleed and reducing the adhesion of the mold-flash/bleed. Furthermore, the applied current produces, hydrogen on the cathode (product). These hydrogen bubbles will initiate the mechanical loosening of the flash/bleed from the metal part of the molded products. After the electrochemical treatment the flash is removed by a high pressure waterjet. 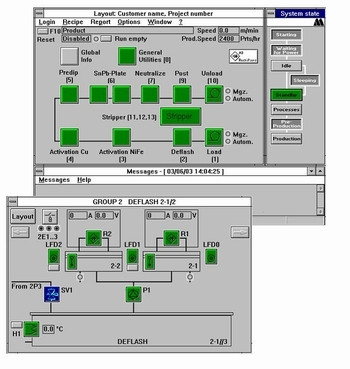 The Electro Plating Control Software (EPCS) makes it easy to control a plating line. It is supplied with an easy to use operator-interface (based on the Windows operating system) giving you a clear view of the status of the plating line. All of the plating lines processes are represented schematically, colors indicating their state. The overal system state of the line is controlled via the state diagram. Switching on the machine and starting or stopping production is established by clicking the mouse. The control system ensures that all process parameters are within specification values before production is started. The most important process parameters are shown too, giving an instant overview of the production situation. All process parameters are easily accessible, all setpoints, warning and error brackets can be modified if that the user is authorized to do so. The complete set of process parameters can be stored in a recipe. Recipes can be reviewed, modified and copied on-line without affecting the recipe currently in use for production. An unlimited number of recipes can be created, enabling fast and easy change-over when switching to products with different specifications. Each user of the control software has his own authorization level. This security level indicates which tasks he is allowed to perform. Before working with the system, every user must identify himself by logging in. After having logged in, the tasks the user is allowed to perform are limited by his authorization level. Tasks that need a higher authorization level are simply not accessible. 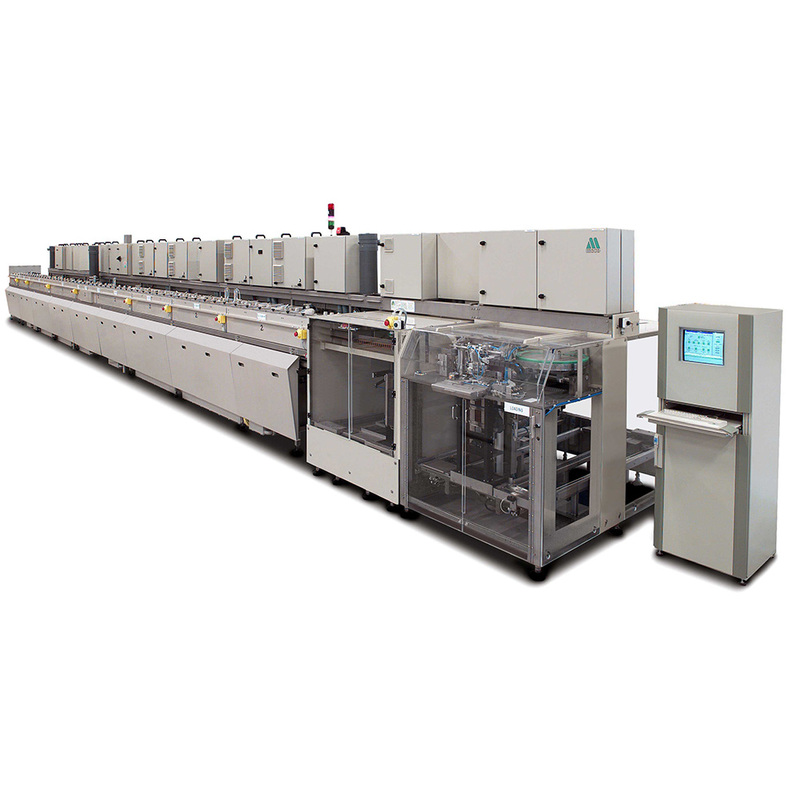 This high quality, generic plating line with its universal loading/unloading system and integrated deflash system ensures you a high quality production with a low water usage resulting in high production yields and low running costs.